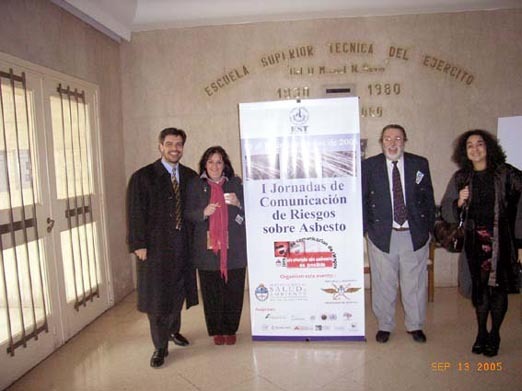 As the result of months of hard work by the seminar originators and organisers, well-known asbestos pioneers Dr. Eduardo Rodríguez and Dr. Ana Digón from the Ministry of Health and Environment and Engineer Adriana Giorgio from the Ministry of Defense, the Asbestos Seminar: Communication of Asbestos Risks was held at the Argentinean Army Technical Superior School "Gral. Div. Manuel N. Savio" in Buenos Aires. Throughout the two-day event, the active participation of Drs. Rodríguez and Digón ensured that the sessions were well-coordinated and focused; their efforts created a positive atmosphere in which productive and lively discussions took place. After the morning registration, Dr. Eduardo Rodríguez and Dr. Ana Digón started the Seminar by giving a warm welcome to the attendants and inviting Dr. Miguel A. Craviotto and Colonel Enrique A. Mahle to address the audience. Both speakers highlighted the importance of the meeting, saying that its aim of informing the community of the political, technical, medical and legal aspects regarding asbestos was a top priority. After this introduction, it was time for Dr. Rodríguez's lecture: Asbestos in the World Today, in which he thoroughly described the global panorama of asbestos, focusing on countries at high risk, such as India, Russia and Brazil. Dr. Rodríguez also mentioned the reluctant attitude of asbestos producers, like Canada, to acknowledge the reality of the asbestos hazard and discussed the situation in Argentina and Latin America in general. Tracing the White Enemy, a Guide for Installed Asbestos Recognition was the lecture given by Architect Susana Mühlmann; this presentation, in Spanish, was an expanded version of the workshop Ms. Mühlmann had given at the GAC 2004, in Tokyo, the abstract of which can be read at http://park3.wakwak.com/~gac2004/en/index_abstract_e.html, Workshop B, Asbestos and Construction, WS-B-08. The next speakers, Mr. Juan Sist and Mr. Alejandro Hansen explained the Installed Asbestos Decontamination Process; they described the treatment and procedures for asbestos removal by using case studies of decontamination projects in Buenos Aires, among which were the Former Caseros Prison, the US Embassy and the Ambassador's Residence decontaminations. The round table: Asbestos Treatments and Final Disposal, coordinated by Ms. Mühlmann, followed the discussion on the asbestos decontamination process. The first speaker, Ms. Maria Fernanda Bauleo, focused her presentation Asbestos Management of Hazardous Debris on current and forthcoming national policies. Afterwards, Mr. Jorge Brión and Mr. Osvaldo Koffman explained, respectively, the policy and classification of the different types of debris the official sanitary landfill CEAMSE receives and treats, and the administrative requirements and operational procedures for asbestos disposal. The last presentation of the day was the Case Study: First Official Asbestos Removal Project, at the Former Caseros Prison, by Lieutenant Colonel Daniel F. Molinari and Engineer Fernando Fornas. Ltnt. Col. Molinari described the work of the Especial Force Q.B.N. for Chemical, Biological and Nuclear Emergencies of the Army's Battalion of Engineers 601 and described its experience with asbestos treatments, particularly removal. The Q.B.N's collaboration with technicians from the Government of Buenos Aires City and Aircon Asbestos Decontamination Systems, from the beginning until the end of the Caseros Prison Asbestos Removal Project, was also discussed. Mr. Fornas, who described the removal project as an innovative process carried out within the complex political parameters of a municipal operation, emphasized the relevance of an interdisciplinary team, in this case formed by civilians and the military, which contained technicians from the public and private sectors working together towards the same aim. Mr. Fornas also mentioned the importance of the online assistance received from experts from countries experienced in asbestos legal and technical aspects, such as Germany and the USA. Since the Caseros Prison Asbestos Removal project was completed, the Public Works Authorities are planning another asbestos removal project at a public hospital, and a program for securing asbestos recognition in public hospitals, schools and administrative buildings of Buenos Aires City. 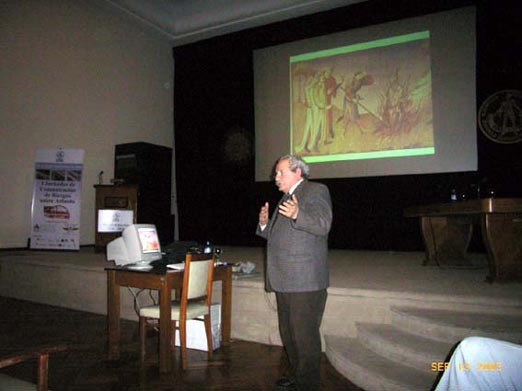 The conference began with a presentation by Geobiologist Claudio Ardohain. In his lecture Asbestos Substitutes and the Consumer's Consciousness Process, Mr. Ardohain stressed the importance of providing information about materials and products so that consumers can consciously select materials that are best for construction or domestic uses. Having given a thorough description of the properties of asbestos, Mr. Ardohain detailed the availability of safer substitutes. A lively debate on the potential risks of new and old materials followed this presentation. 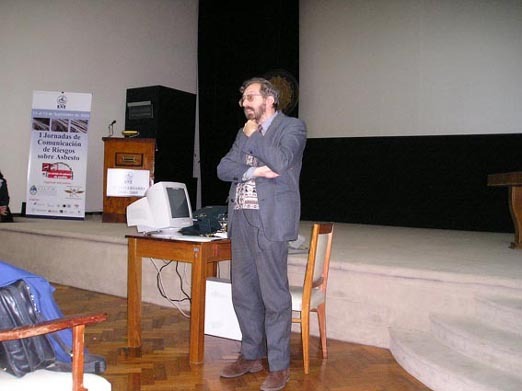 Mr. Antonio Brailowsky gave a revealing lecture: Asbestos in History, in which, he amusingly described the relation and impact between asbestos, technology, religion, popular myths and political power. The Impact on Health round table, coordinated by Dr. Eduardo Rodríguez, included discussion of the fundamental aspects of asbestos treatments and procedures. In his presentation: The Asbestos Laboratory, Dr. Arnaldo Caldirola explained the usage of different types of analysis such as bulk air samples to verify the presence of asbestos among other materials, to detect asbestos on site or to certify that a place is asbestos free after a removal. Within the subject Impact on Health, the communication of asbestos risks to the community is a fundamental topic. Dr. Antonio Labbate addressed this issue in his paper Asbestos Related Diseases; he also discussed the incidence of Asbestosis, Lung Cancer and Mesothelioma in Argentina and globally. 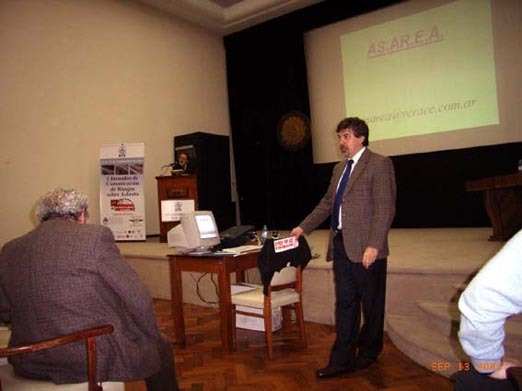 Close to the end of the Conference, the formation of a new association was announced by Dr. Mariano Acevedo: AS.AR.E.A., Asociación Argentina de Expuestos al Asbesto (Argentinean Association for Exposed to Asbestos). Dr. Acevedo also announced the creation of a Scientific Technical Advisor Committee with honorary members including: Dr. Rodríguez, Dr. Digón, Dr. Labbate, Ms. Mühlmann, Ms. Fernanda Giannasi from ABREA Brazil, and Dr. Barry Castleman from the USA. Amongst the first steps to be taken by this Committee are: making contact with worldwide asbestos victims' organizations and inviting more international experts to be part of this new Argentinean initiative. To supplement the oral presentations, exhibitions of specialist equipment were on show, including a Decon Unit, technical equipment, personal protection and decontamination products such as surfactants and encapsulants for the removal procedures that Aircon Asbestos Decontamination Systems installed, together with a portable air sampler sent by Deconta from Germany. 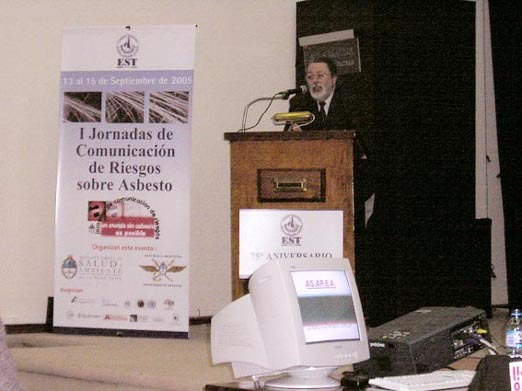 Videos of asbestos documentaries from Brazil and from France were shown in Spanish versions; for more information on these documentaries contact Mrs. Adriana Giorgio, adrisa@fibertel.com.ar or gioadr@mindef.gov.ar. The presence at the conference of the stunning photographic exhibition by Hein du Plessis which reveals the dramatic and horrific impact that asbestos has had on South African communities made a dramatic impact on conference delegates. Dr. Eduardo Rodríguez, from the Occupational Health Department and Asbestos Advisor Commission at the Ministry of Health and Environment. Dr. Ana Digón, from the Hazardous Chemicals Management Project and Asbestos Advisor Commission at the Ministry of Health and Environment. Engineer Adriana Giorgio, from the Environmental Area at the Ministry of Defense. Drs. Carlos Damin, Ana Digón, Eduardo Rodríguez and Architect Susana Mühlmann. Dr. Miguel A. Craviotto, National Director of Environmental Management at the Secretary of Environment and Sustainable Development at the Ministry of Health and Environment. Colonel Enrique A. Mahle, Technical Superior School Sub-Director, Argentinean Army. 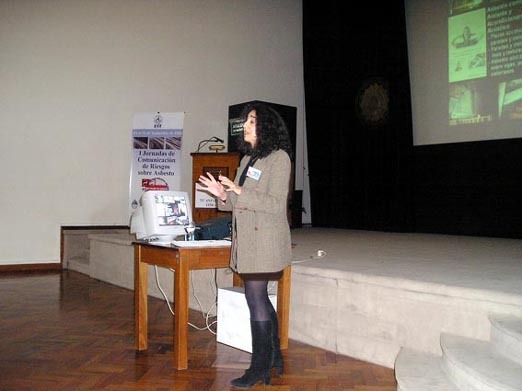 Architect Susana Mühlmann, Government of Buenos Aires City  Public Works General Direction technical advisor for the Former Caseros Prison Asbestos Removal Project. Mr. Juan Sist and Mr. Alejandro Hansen, Manager Directors of Aircon, Asbestos Decontamination Systems. Ms. Maria Fernanda Bauleo, expert on Hygiene and Safety of the Ministry of Health and Environment. Mr. Jorge Brión and Mr. Osvaldo Koffman, both engineers of the official sanitary landfill, CEAMSE. 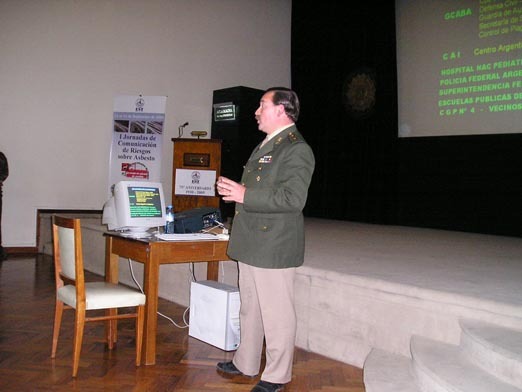 Lieutenant Colonel Daniel F. Molinari, Argentinean Army, Manager Director of the Former Caseros Prison Demolition Project. Engineer Fernando Fornas, Former Director of Public Works General Direction at the Government of Buenos Aires City, in charge of the Former Caseros Prison Demolition Project during the Asbestos Removal Project. 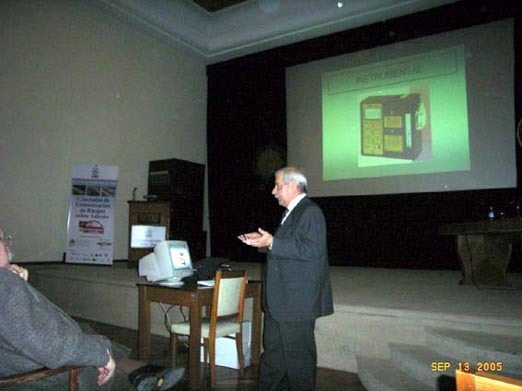 Geobiologist Claudio Ardohain, President of GEA Argentina  Association of Geobiology, with headquarters in Spain. Mr. Antonio Brailowsky, economist and environmentalist, former Environmental Ombudsman of Buenos Aires City and author of numerous publications on ecology, environment, economics and the history of Argentina. 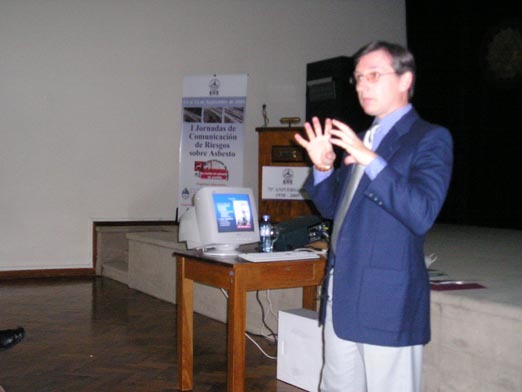 Dr. Arnaldo Caldirola, biochemist, specialist of clinical prognosis, and author of national asbestos occupational regulations from the Ministry of Labour. Dr. Antonio Labbate, experienced and highly recognized specialist from the Argentinean Association of Respiratory Medicine. Dr. Mariano Acevedo, attorney at law, member of CINEA, Centre for Environmental Studies and Research and the Civil Responsibility Cathedra at the Faculty of Law of the University of Buenos Aires.